LCD displays offer super sharp pictures and great color. But do the pros outweigh the cons when it comes to LCD TV displays? Before deciding on a thumbs up or thumbs down, you should understand how an LCD display works. The LCD consists of a large number of pixels, or picture elements, consisting of liquid crystal molecules held between two sets of transparent electrodes. The liquid crystals react in predictable ways when the electrical charge running between those electrodes is changed — meaning they twist and move in ways that let different amounts (and colors) of light through the crystals. The LCD has a control system that translates your video signals into the proper charges for each electrode. A light source shines through the LCD panel and creates your picture. 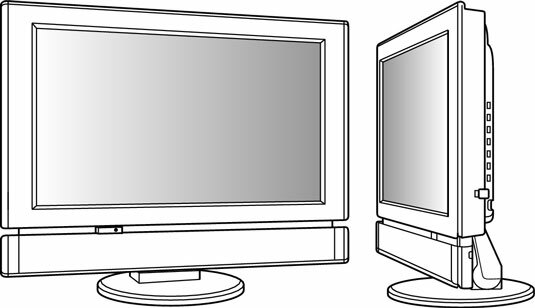 When compared to the other type of flat-panel display (plasma), LCDs tend to be found on the smaller size of the spectrum. You’ll rarely find a plasma TV smaller than 42 inches, but you can find LCDs at sizes as small as 13 inches. The majority of LCDs are high-definition TVs and are built in the widescreen 16:9 aspect ratio, although you can still find 4:3 versions in smaller sizes (under 20 inches or so). Choose an LCD display for sharp, eye-popping pictures. Extremely high resolutions: LCDs can easily reach HDTV resolutions (in fact, most LCD displays do). You can find a 1080p-capable LCD display in all but the smallest sizes — while many plasma displays are still 720p. Excellent color: LCDs offer exceptional reproduction of colors, with the potential for beautifully re-created colors across the spectrum. This differs from other flat-panel displays (such as plasma systems), which often tend to display certain colors inaccurately. Great picture: The newest and most expensive LCDs use an LED (light emitting diode) instead of a traditional bulb for their light source. These LEDs produce a higher-quality picture because the LED itself emits a more natural (closer to daylight) light than a bulb (which tends to be yellowish, not true white). Energy efficiency: LCD HDTVs are perhaps the greenest HDTVs. Compared to plasmas, LCD HDTVs use less electricity to run. You can probably expect to use about 30 percent less power for an LCD than for a similar-sized plasma. PC monitor-capable: Most LCD television displays can also do double-duty as a PC monitor, plugging directly into any PC with a standard PC video cable. No burn-in: If you play a lot of video games, watch the stock ticker on MSNBC, or do other things with your display that involve a lot of static content (images that don’t change or move around) on a CRT display, you can end up with those images permanently burned into the phosphors on your screen. Because LCDs use a separate backlight instead of creating their own light with phosphors, they are immune to this problem (plasmas are not, by the way). Inherently progressive: Unlike direct-view systems, LCDs don’t display their picture using electron guns scanning lines across a screen. Instead, LCDs use millions of tiny transistors that can be individually controlled by the “brains” inside the display. This means that LCDs can easily handle progressive-scan sources, such as progressive-scan DVD and HDTV. Slightly more expensive for their size: Inch for viewing inch, LCDs tend to be a bit more expensive than plasma flat-panels. Poor reproduction of blacks: Compared with direct-view tube displays, LCDs do a poor job of reproducing black images. Darker screen images never show up as true black, but rather as various shades of gray, and actions happening in these darker areas are difficult to discern. Limited viewing angle: Although they are getting better due to some intensive efforts by manufacturers, LCDs typically have a poor viewing angle. If you are not sitting almost directly in front of the screen, you don’t get a good picture. Limited brightness: Because LCDs use a backlight shining through the liquid crystal, most of the light is absorbed. As a result, the LCD displays have lower contrast and are harder to view in a brightly lit room (the picture appears washed out), compared with plasma TVs. LCD TVs with LED backlights do better in this regard.